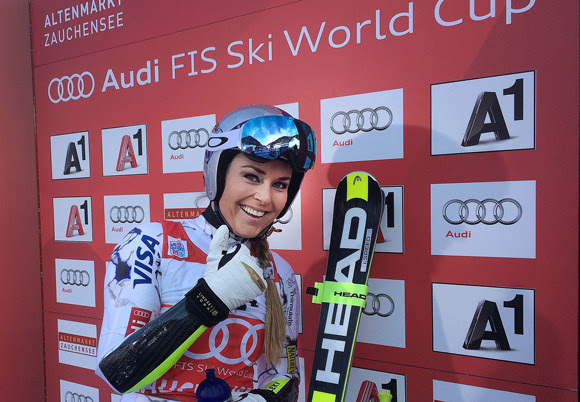 ALTENMARKT, Austria (Jan. 9, 2016) – Lindsey Vonn (Vail, CO) extended her super G win streak to four with a commanding victory over her top rival in the hunt for the overall World Cup title at Sunday’s Audi FIS Alpine World Cup. Despite some initial doubt, Vonn absolutely crushed the course for her 73rd overall World Cup victory. Switzerland’s Lara Gut, the current overall World Cup leader, was second. Austria’s Cornelia Huetter in third. “I don’t think that was good enough,” Vonn said after coming out of the 16th start position to best then current leader Francesca Marsaglia of Italy by a whopping 1.34 seconds. But indeed it was good enough as Gut, wearing bib 17, didn’t carry enough speed into the bottom section of the course and settled into second place, .70 off Vonn’s winning time. Vonn led another solid American team effort as Laurenne Ross (Bend, OR) finished 12th, Stacey Cook (Mammoth Mountain, CA) 28th, Jackie Wiles (Aurora, OR) 30th, Breezy Johnson (Salt Lake City, UT) 39th, Alice McKennis (Glenwood Springs, CO) 40th and Abby Ghent (Edwards, CO) 41st. Anna Marno (Steamboat Springs, CO) DNFed. 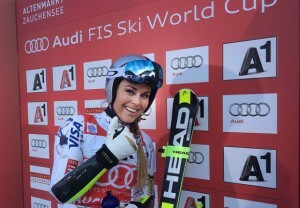 With the victory, Vonn closed to within 38 points of Gut’s overall World Cup lead. She credits her two-victory success this weekend to a long break back home in Colorado over the holidays with family and friends. “I had a lot of confidence after Lake Louise and then in Val d’Isere I felt like I lost my confidence a little bit after going out in the downhill,” she said. “I went home, I had a good break and I feel energized again. I feel really good mentally and physically, and I think that showed in this weekend’s racing. Up next, the women’s tech team heads to Flachau, Austria for slalom Tuesday. Lindsey Vonn (Vail, CO) won her 73rd career World Cup victory, and her fourth-straight World Cup super G.
Lara Gut continues to lead the overall World Cup standings by 38 points over Vonn. Vonn leads the World Cup super G standings by 80 points over Cornelia Huetter. Katja Seizinger of Germany won a record five super G races in a row between March and December 1997. Vonn has now won four in a row for the second time in her career. Vonn’s first streak was between February and March 2009, and the current streak dates back to March of 2015. The bottom part of this course … was the most important part of the course. I think I was smart with my tactics and I felt like I was going pretty fast. But, you never know until you get to the finish. I had a lot of confidence after Lake Louise and then in Val d’Isere I felt like I lost my confidence a little bit after going out in the downhill. I went home, I had a good break and I feel energized again. I feel really good mentally and physically, and I think that showed in this weekend’s racing. It’s a perfect start to the New Year. Hopefully I can just continue on in this direction and hopefully just keep winning.